A year after leading major street protests aimed at toppling the Pakistani government, populist preacher Tahirul Qadri says he has turned back to religion, but remains prepared to re-launch his “revolution” when the time is right. Weeks of sit-in protests by supporters of Qadri and opposition politician Imran Khan reached a climax in early September 2014 as protesters clashed with police and stormed the state broadcaster. For a few hours it looked as if Prime Minister Nawaz Sharif’s government might fall, but the crisis abated and eventually the protesters went home. Qadri, a mercurial figure who also brought Islamabad to a standstill with mass protests in early 2013, wanted Sharif to resign and demanded sweeping changes to the country’s political and welfare system. 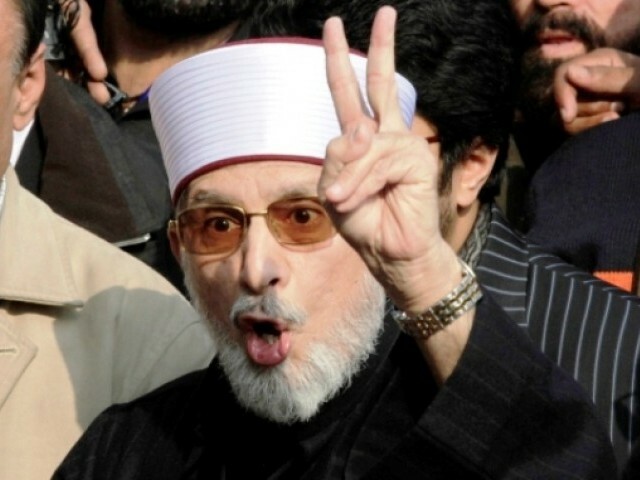 The protests fizzled out and Qadri left Pakistan for medical treatment. Earlier this year he quietly returned, this time to lead not rumbustious street protests but a 10-day prayer vigil during the month of Ramzan. Thousands of his followers of all ages gathered in two vast compounds in Lahore to pray, fast, sleep and eat together. The 64-year-old began leading the annual vigil in Lahore three decades ago and it formed the basis of his Pakistan Awami Tehreek (PAT) political movement, founded in 1989. But when AFP interviewed him at the event in Lahore, Qadri refused to answer questions about his 2013 and 2014 protests and what the future might hold for him politically. When the protests were going on, some — including members of Sharif’s ruling PML-N party — accused him of being a puppet, working on behalf of the powerful military to try to destabilise the elected civilian government in a bid to increase the generals’ influence. Qadri would not address the allegation directly but condemned his critics in general terms. “There have always been opponents…The opponents always propagate negatively and I can’t come to their level to answer their propaganda,” he told AFP. His reticence now stands in stark contrast to the vehemence with which he lambasted the government last year in daily speeches to his followers outside parliament from the top of a shipping container that served as a podium. Despite his denials, the rumours of army backing linger around a man whose only spell as a lawmaker came during the rule of military strongman Pervez Musharraf. “Qadri always wanted to get a top political office in the country with the support of the powers who themselves stay behind the curtain,” said Tahir Ashrafi, another cleric and chairman of the Pakistan Ulema Council, a representative body of the country’s religious scholars. Senior political analyst Rasul Bakhsh Rais said Qadri’s ability to summon large, disruptive street crowds at short notice had made him an attractive ally for murky forces — even if he did not necessarily share their agenda. “He has his ambitions but he is used by the secret forces without him being known,” Rais told AFP. Last year’s protests may not have brought down Sharif’s government but they were seen by many observers as weakening it and boosting the military’s influence, particularly in the policy areas it has traditionally dominated — defence and foreign affairs. Qadri’s supporters still have confidence he will lead the country to a bright new future and say they are ready for the next round of their struggle, whenever it comes. “We still stand for our mission and will stand for it until the end. The revolution doesn’t come with one, two or five sit-ins,” said Shamsur Rehman Mehsud, 19, a follower from South Waziristan tribal district on the Afghan border. And while Qadri may be guarded in discussing what his future tactics might be, he is no less fervent than before when rousing his followers. “We won’t forgive the blood of martyrs of our struggle to bring revolution in this country,” he said in one of his Ramzan addresses.